Granddaughter and I went to check on the turtle eggs we witnessed being laid back on July 2 near a hackberry tree, to see if they had begun to hatch. So far there's no evidence that they have dug their way out just yet. While we were looking we discovered a leaf on the hackberry tree that had seven tiny jewels upon its surface. 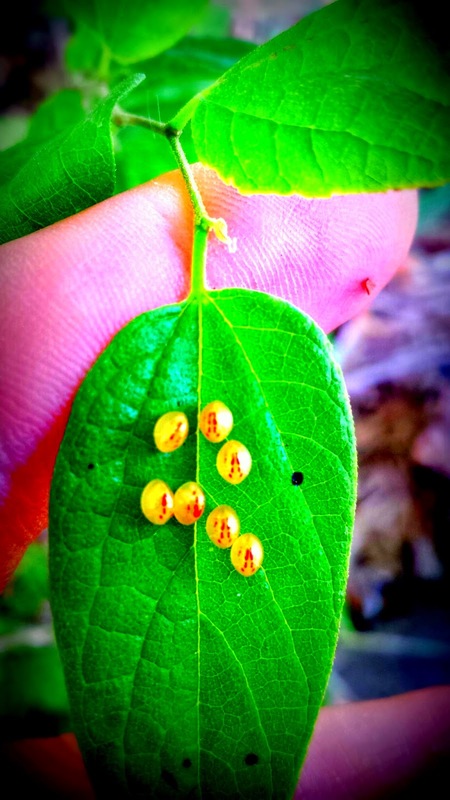 These were the eggs of the hackberry emperor butterfly. This tree is the host plant for this particular species of butterfly. When butterfly eggs are laid the female attaches them using a naturally produced glue-like substance to keep them in place. The eggs are laid either singularly, in small clusters, or in a mass. If you were able to look at these eggs under a microscope you would notice a spot known as a "micropyle", which is a "little door" where the spermatozoa of the male enter to fertilize the egg. The micropyle also allows water and air to enter the egg as it develops. Just like a chicken egg, there is yolk inside which nourishes the growing caterpillar. As the caterpillar reaches maturity it frees itself by eating its way out of the egg and then feeds upon the host plant's leaves until its ready to transform by metamorphosis into a chrysalis or pupa and then eventually into a new butterfly. What a nice find! Mystery Sea Monster Eats Shark? ?